Collaboration – kəˌlabəˈrāSH(ə)n/ noun, the action of working with someone to produce or create something. Sunday comes around every week. And no matter the size or style of worship, clergy and musicians are in a constant act of working together to “produce or create something”–of co-laboring to bring the Word of God alive. Do you have a desire for the creative process to be more clear and have a common vocabulary to take the work to a deeper and higher level? Would you like to bring a sensory-rich expression of the Word that touches mind and heart in powerful ways week after week? 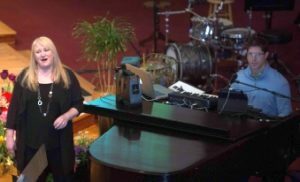 Dr. Marcia McFee and Mr. Chuck Bell are offering a ground-breaking one-day workshop that brings clergy and musicians together in a learning environment that will enrich collaborations with exciting creative processes and skills.